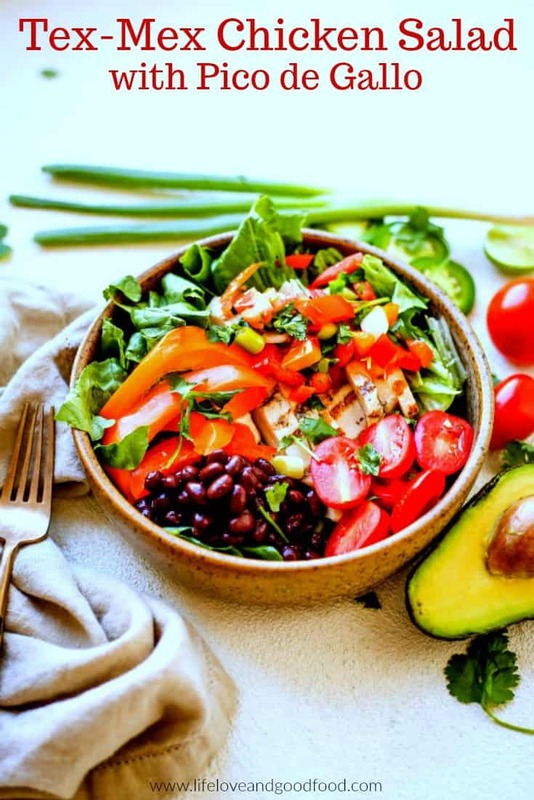 Tex-Mex Chicken Salad with Pico de Gallo is a bowl full of deliciousness that you can feel good about eating! 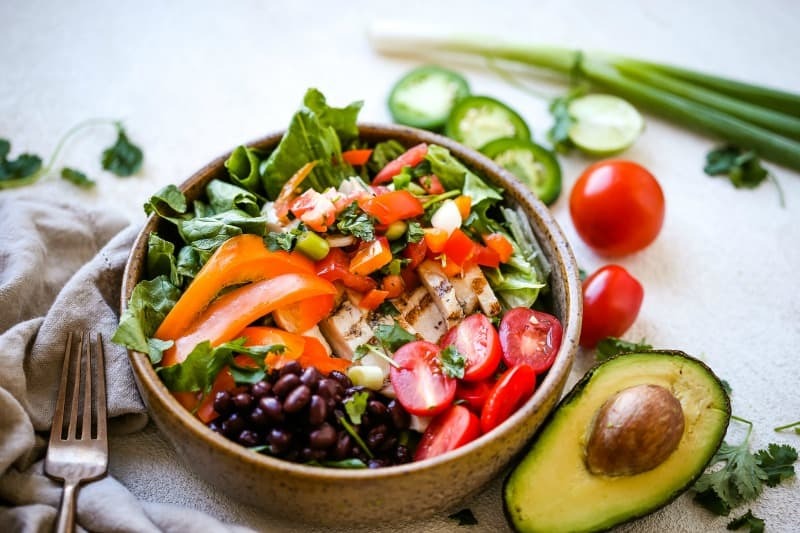 I’m not sure whether this dish should be called a Tex-Mex or a Southwest Chicken Salad (it’s hard to find the definitive differences) but regardless, this salad is a refreshing change to the heavy eating I’ve been doing lately! 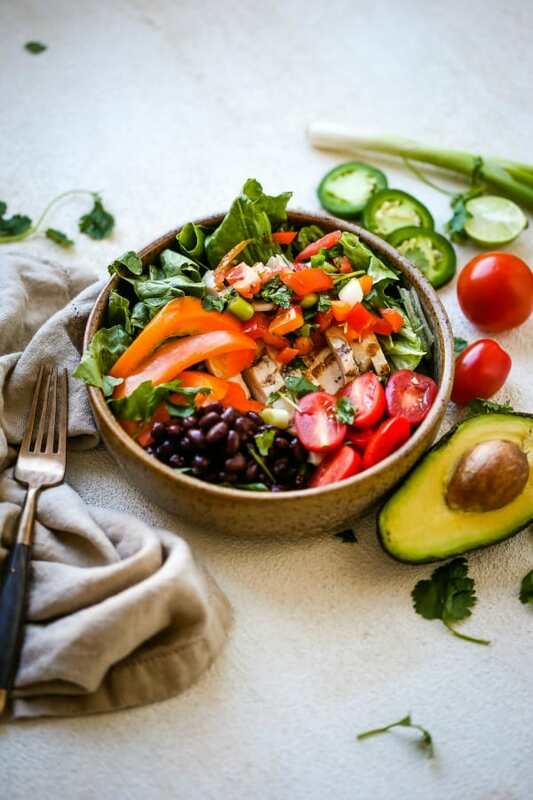 Fresh mixed greens are topped with protein-packed black beans and perfectly seasoned grilled chicken, bell peppers, tomatoes, avocado and salsa fresca — or pico de gallo. No additional dressing is needed, but a dollop of sour cream or a drizzle of Ranch style dressing certainly doesn’t hurt! I know that it’s soup season, but here I am craving fresh salads and I don’t think I’m the only one. 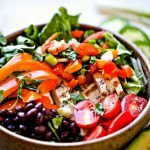 Just this week, the Catalina Salad that I originally posted three years ago has gotten more hits in two days than for the entire time it’s been posted on the blog — yay! For that reason, I think there are more of you out there who feel like I do. Who feel their bodies are nudging them to detox from all the rich foods they consumed the last couple of months. That must be why this delicious Tex-Mex Chicken Salad was so satisfying when I made it again last night. You won’t find me talking a lot about health food or diets here on the blog, but my focus will always be to try to eat a balanced diet so that I can enjoy a few indulgences here and there. Again, I’m reminding myself that it’s all about moderation! Tex-Mex Chicken Salad with Pico de Gallo checks all the nutrition boxes. With these ingredients, and by leaving off a heavy, calorie-laden dressing, you can feel good about making and serving this salad. 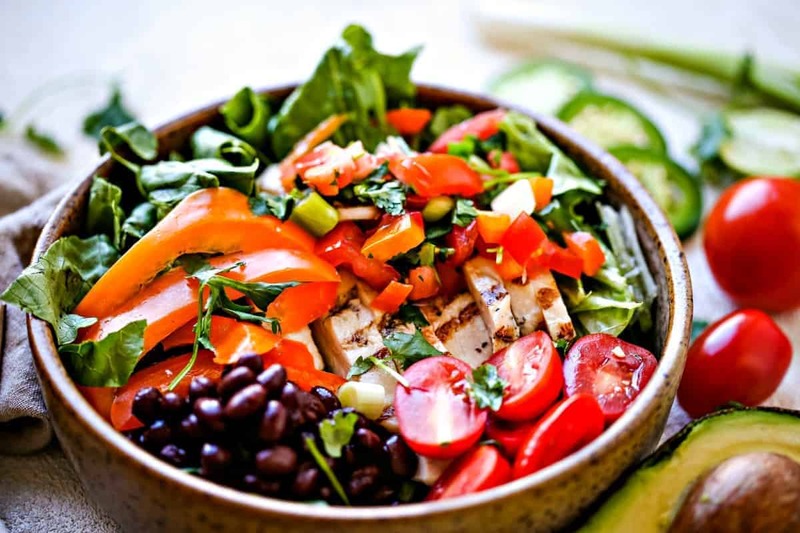 Chicken breasts are a good source of protein (as are the black beans in this salad), are low in sodium, and have zero grams of carbs. Black beans are a good source of fiber and can decrease your risk of diabetes, heart disease, and some cancers. One cup has 15 grams of protein and can help you stay fuller, longer. Bell peppers are rich in vitamin C and are loaded with various vitamins and minerals, and other antioxidants. Tomatoes are also a good source of vitamin C, as well as potassium. Tomatoes are the major dietary source of the antioxidant lycopene, which has been linked to reduced risk of heart disease and cancer. Romaine lettuce has gotten a bad wrap lately, but let’s not forget that it is rich in vitamins A and K and studies show that it may improve blood lipid levels. Besides containing capsaicin (which gives them their spice), jalapeños are a good source of fiber, vitamin C, and vitamin B6. All of these ingredients are low in calories, too! Fresh ingredients make Tex-Mex Chicken Salad extra special. It’s best to use Roma tomatoes in the pico de gallo because they are firmer in texture. As the pico de gallo sits, the tomatoes will release their juices and there will be more moisture to coat the leafy greens — you probably won’t even miss adding a heavy dressing on top! Also, the spice rub doesn’t have as much salt as most to keep the sodium under control. Super Food Salad with Ginger Sesame Dressing — This salad has amazing color, interesting ingredients, crunchy texture, and delicious taste! Avocado Caesar Dressing — Substitute avocado for mayo in this creamy, delicious Avocado Caesar Dressing for half the fat of a regular Caesar dressing! Turkey Mini Meatloaf with Honey Dijon Glaze — Try this lighter and healthier turkey meatloaf with its sweet and tangy honey Dijon glaze and you may never go back to Grandma’s traditional recipe! Sesame Chicken Salad — You’ll love this recipe for Sesame Chicken Salad with a fresh ginger-infused vinaigrette. And, the fact that it’s heart healthy is an added bonus! BBQ Turkey Stuffed Peppers — BBQ Turkey Stuffed Peppers. Bake BBQ-flavored turkey mixture in red, yellow, or green sweet bell peppers for a tasty and colorful dinner entrée. Did you make this Tex-Mex Chicken Salad with Pico de Gallo recipe? With plenty of fresh ingredients, and by leaving off a heavy, calorie-laden dressing, you can feel good all day long about this salad! Divide salad greens among 4 large salad bowls. Top each with bell peppers, black beans, and tomatoes. Refrigerate until ready to assemble the rest of the salad. Place all the ingredients for the pico de gallo into a medium size bowl and toss gently. Refrigerate until ready to serve. Preheat grill or grill pan to medium high heat. Combine the spices in a small prep bowl. Brush the chicken breasts with olive oil and sprinkle spice mixture on all sides. Grill chicken for about 5-6 minutes on each side or until white all the way through. Allow chicken to rest for 5-10 minutes, then thinly slice or chop into bite size pieces. 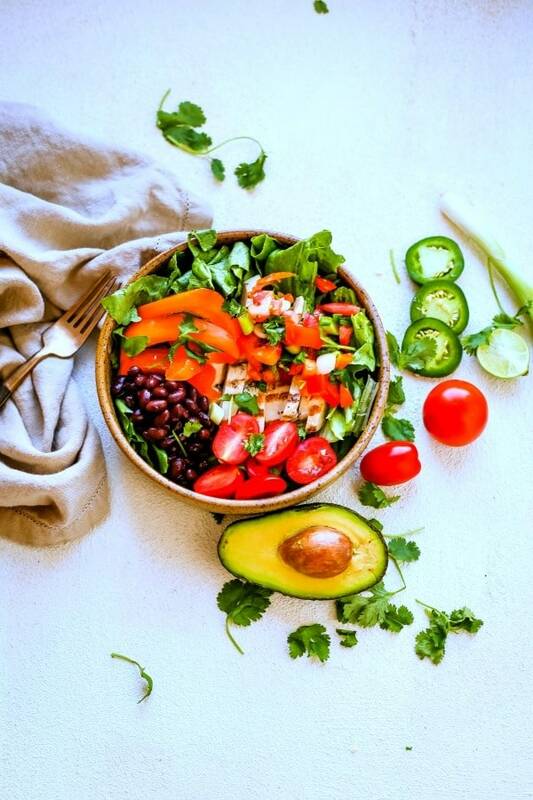 Remove salads from the refrigerator and top with sliced avocado, chicken, and pico de gallo. If desired, serve with a dollop of sour cream or a drizzle of Ranch dressing. My husband makes the best pico de gallo. Never would have thought to add chicken to it. Fortunately I have cooked chicken defrosting in the fridge, so we decided to try your recipe for a quick lunch. Pretty good! Will make it again. Thanks so much for the great recipe.